Peterborough have progressed to the Elite League Knockout Cup semi-final at the expense of Swindon after the tie was decided by a draw out of a hat. The first leg was due to take place at Alwalton on Thursday but the meeting fell foul of the weather. With the Robins involved in the play-off final next week - and the season ending on 31 October - it was decided a draw would determine the result. 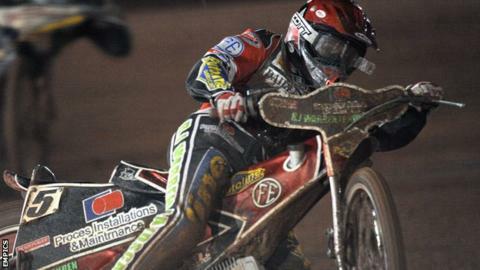 The Panthers will meet Swindon's Grand Final opponents Poole in the semis. The winner will face either Birmingham or Coventry in the final. British Speedway management committee member David Hoggart said: "The weather this year has placed the sport in uncharted territory and we have had to make unprecedented decisions to maintain some sort of continuity of racing. "This is hardly the ideal way for Swindon to go out after such a good season, but to allow a delay would put them in the position of staging three home meetings next week, and place an unrealistic financial burden on their supporters. "The competition has to reach a conclusion by October 31 and we could see a scenario where clubs could be running two fixtures in the last week of the month. "That's only palatable if we can guarantee the weather - but we can't, so we have had to act. "I'd like to thank both promotions for agreeing to take this step, congratulations to Peterborough and of course our commiserations go to Swindon." Swindon co-promotor added: "We have absolutely no problem with the way the issue has been handled and I would stress that both Peterborough and ourselves were consulted ahead of any decision being made. "Peterborough go through to the semi-final against Poole Pirates with our very best wishes and we now focus solely on a massive meeting against the same opposition here on Monday."